Rock Paper Lizard: Not a heron. 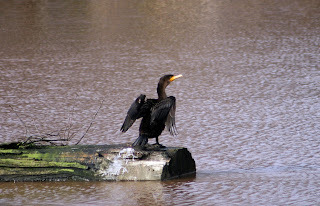 I was about to take a picture of the cormorant who evidently often lingers on the log in the park pond. I was swarmed by grade 4s from the nearby school, out for a nature ramble with their coffee-toting teachers. They stopped and looked at the bird. "Sorry," said one of the teachers. She meant sorry about the kids getting my way. I said it was okay. I asked her to ask the kids what kind of bird it was. She looked at me as if it were a brilliantly crazy idea. "What kind of bird is that, children?" "A heron," someone said. "That's right, it's a heron." And the ramble recommenced. "It's not a heron!" I yelled. They stopped. "It's not?" 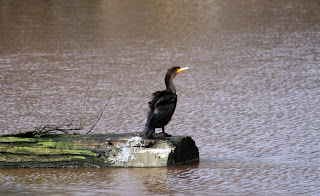 "No, it's a cormorant." Same teacher: "Is that a kind of heron?" Me: "No." A little blond-haired, blue-eyed fella, my nine-year-old doppelganger, piped up. 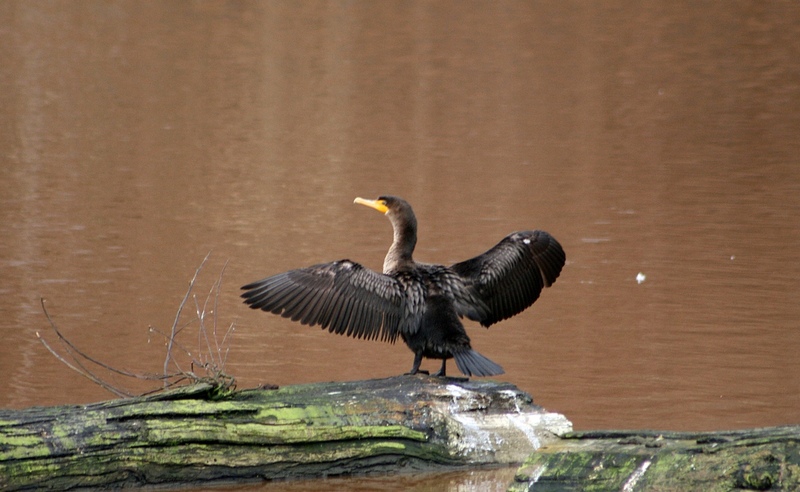 "Herons are bigger and have a bigger beak and way longer legs. 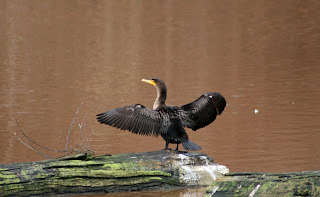 The cormorant has legs like a duck." The teacher looked at the boy fondly. "Our resident expert." 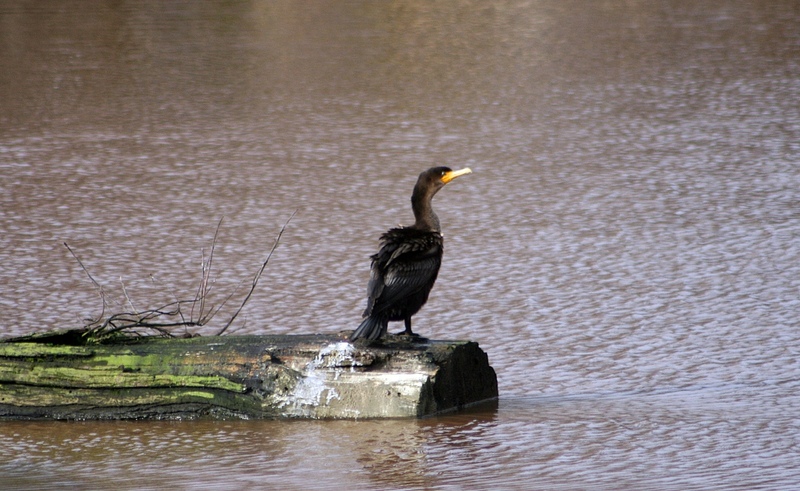 Then, as they rambled on, the cormorant did this. I almost yelled, "Herons also don't do that!" but it was too late. Had it been a heron and I asked them what it was, you know what the answer would have been. Whenever I'm visiting my parents and we go for a walk to admire all the local herons and egrets, we enjoy striking up conversations with other people doing the same thing so that we can politely correct their use of the word "crane." Heh...funny anecdote, and all too true. Ha ha ha, excellent! That teacher should pay more attention to her "resident expert!" It amazes me how some people are A-okay with "identifying" wildlife species to "educate" others when they really have no idea what they're talking about. I'm a huge fan of "I don't know, but let's find out!" =) Taught that lesson when I was a baby ranger: never B.S. Once I overheard a woman angrily scolding/correcting her young son, "spiders are NOT arachnids, they are INSECTS!" The little guy had apparently had the audacity to teach his mama 8 v. 6 legs. Bet that never happened again. Yikes! ...and anecdotes like this are why the Interpreter needs to return to save the day. That kid gives me hope for the future.